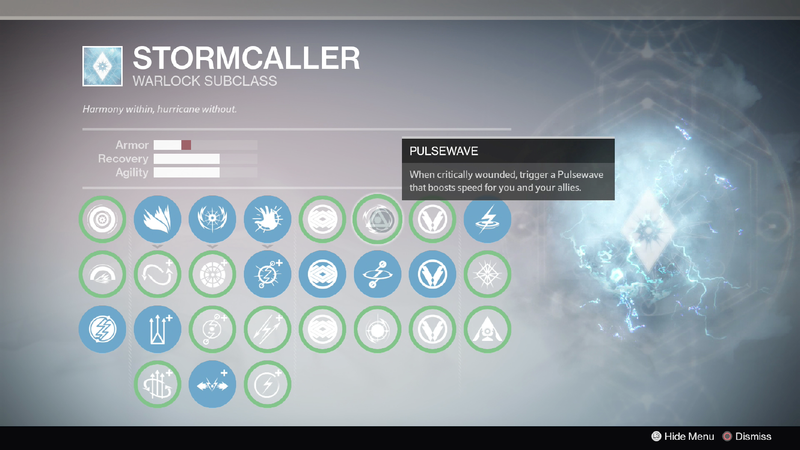 If Nightstalker had the most changes, and Sunbreaker the fewest, then Stormcaller falls somewhere in between. The new Warlock subclass was more than just bare bones, but had a few perks that didn’t connect strongly to the tone or feel of the class, and a few more whose abilities were ill-defined or lacking. Bungie has spiffed up the Sith Lord for their final build, and we’re excited to take a second look, straight into the eye of the storm. Bungie very wisely removed Lightning Grenade from the Stormcaller’s available pool. 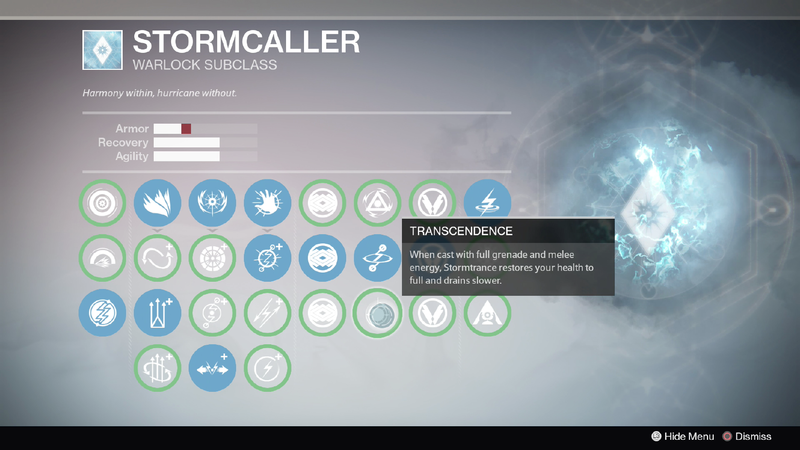 On top of being the second grenade pulled from the Striker subclass, it simply did not fit the mysticism or aesthetic of the Stormcaller. The Lightning grenade was clearly a physical construct, and thus more suited to the no-nonsense Titan than the high-minded Warlock. The Bladedancer’s Arcbolt is a much better thematic fit. Both are strong PvP grenades, though the Stormcaller will undoubtedly miss the allure of chaining additional bolts from a Lightning Grenade. Other than that, the Deluge Grenade was lamely renamed as the “Storm Grenade”, a fitting, if bland name for the new option. These were unchanged. 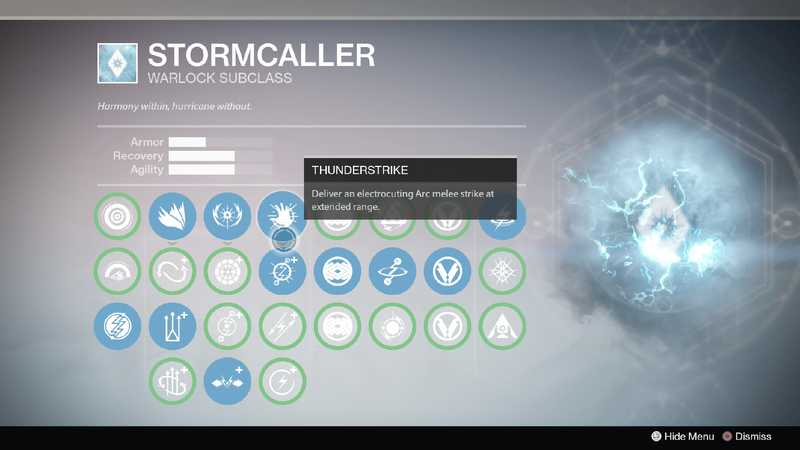 The Stormcaller still possesses the Sunsinger’s Glide profile, with Increased Control, Focused Burst, and Balanced Glide. 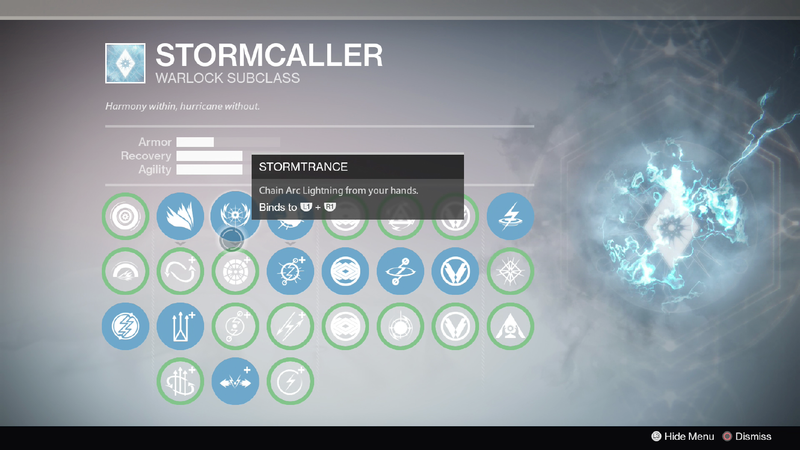 No Blink for the Stormcaller… except during Stormtrance! Landfall: On casting Stormtrance, fire a bolt of lightning into the ground, creating a devastating shockwave under you. This talent is unchanged from its initial version. As we saw in the Strike Twitch stream, Landfall needn’t be activated while on the ground. 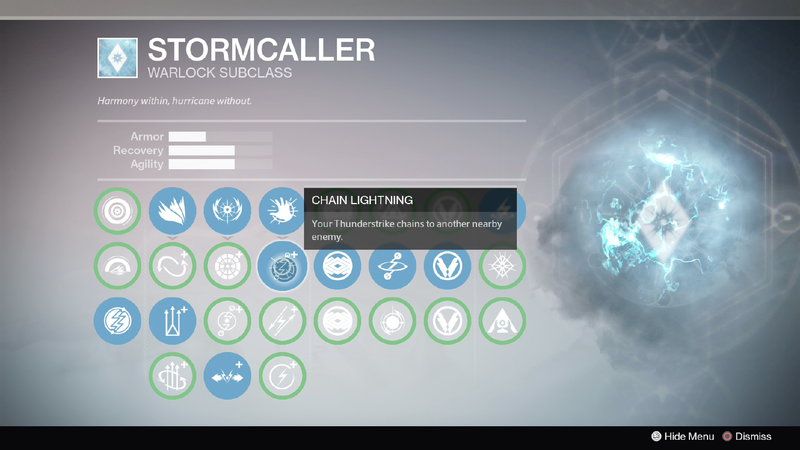 The Stormcaller will call in a powerful Lightning strike even if he or she activates the Super in mid-air, making it a more potent offensive tool than just a close-range panic button. Check out the Stream for footage of Cozmo calling in Zeus’ wrath. 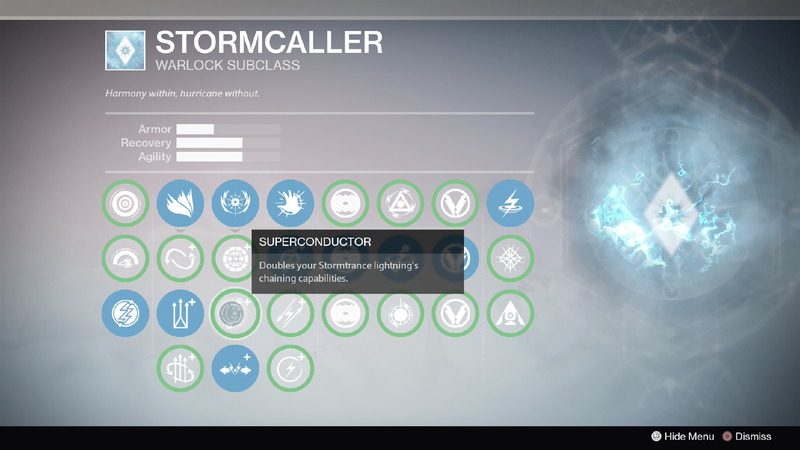 Superconductor: Doubles your Stormtrance lightning’s chaining capabilities. Bungie has been updating descriptions to be more clear, but they still didn’t bother edifying Superconductor. Your Stormtrance’s Lightning chaining capabilities are “doubled”. Again, is it distance? Number of foes that can be electrocuted simultaneously? Guess we’ll find out soon! 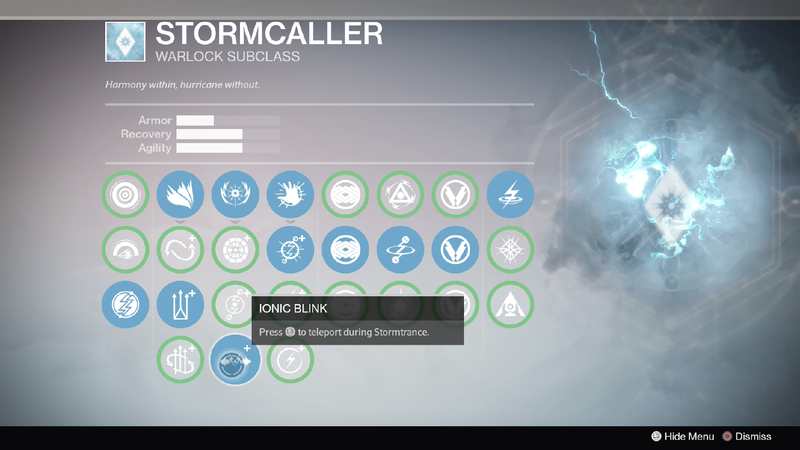 NEW Ionic Blink: Press L3 to teleport during Stormtrance. This is the same perk that was once called “Electric Glide.” Electric Glide sounds like an automatic Swiffer or something. 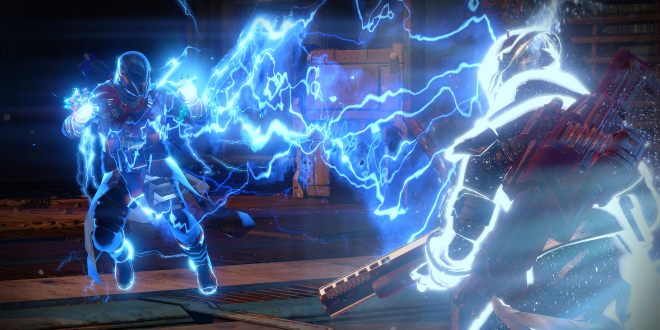 The mobility and speed of the Stormcaller is perfectly accented with this short-range teleport. 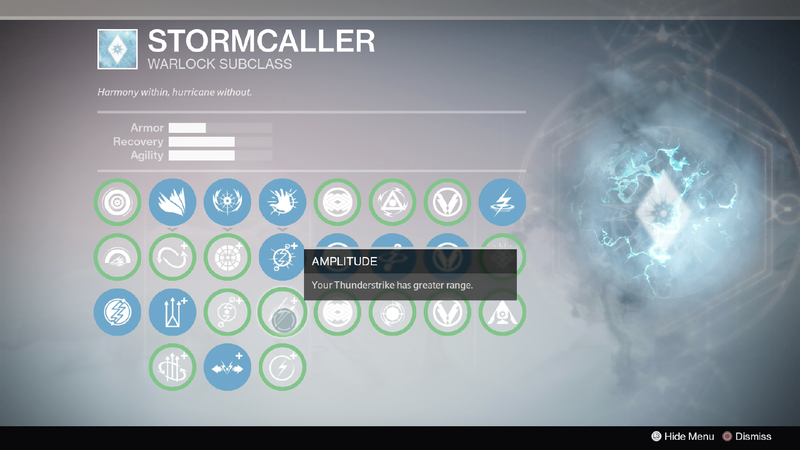 NEW Amplitude: Your Thunderstrike has a greater range. Replaces Tempestuous as the perk to lengthen the range of your Thunderstrike. Other than that, the effect is unchanged. With the revelation of the new perk “Feedback”, Amplitude seems like an obvious pairing if you feel inclined to lean on your melee in appropriate level content without the Lightswitch modifier. NEW Pulsewave: When critically wounded, trigger a Pulsewave that boosts speed for you and your allies. We got to see the effects of this perk in actual gameplay today, and they were noticeable! Critically wounded appears to mean that a Guardian was stripped of his or her shield and reduced to red-bar health only. At this point, all movement speed is amped up for your fireteam for 9 seconds. This is enough time to safely remove yourself from the aggression that caught you by surprise or overwhelmed you. It’s a bit of a safety net, but could even be worked into an intentional strategy providing the Stormcaller in question has an escape plan. Of course, movement speed isn’t necessarily worth risking death, so you may find its use to simply be in beating a hasty retreat – in PvE and PvP. The best part? Pulsewave replaced the strange and out-of-place Rain Check, which didn’t seem to be engineered with plausible PvE scenarios in mind, though it arguably could have had a niche surprise factor in the Crucible. NEW Feedback: Incoming melee attacks fully recharge and intensify your Thunderstrike. 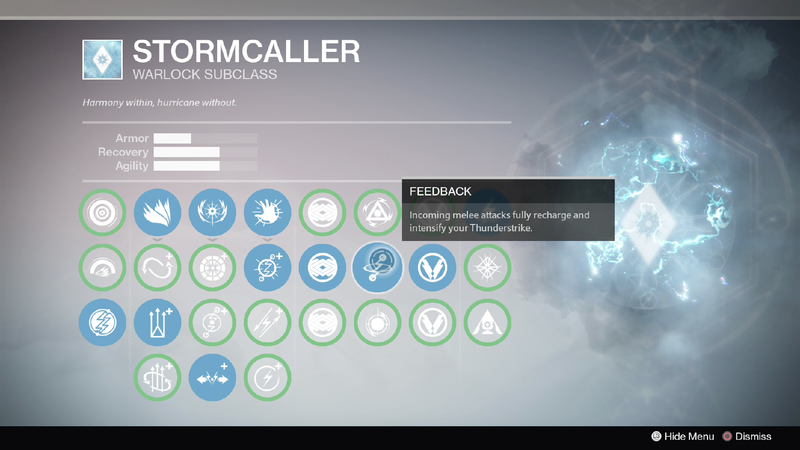 The Stormcaller certainly has no shortage of CD-friendly perks. On top of the small Armor boost, taking any melee damage will immediately recharge your Thunderstrike, as well boost what we can only assume to be the damage of its next use. You can pair this with Amplitude for the strongest melee with the farthest range, or even with Rising Storm to create a crazy positive feedback loop to significantly reduce your CDs of Super, Melee, and Grenade. While it’d be very surprising if the increased damage were enough to push Thunderstrike into one-hit-kill ranges in the Crucible, we aren’t ruling it out. However we’re not certain if you can store this extra potency for very long, so (Thunder)strike while the iron is hot! Obviously, you’ll only want to use this perk when you can afford to sponge an incoming melee. Otherwise, Pulsewave or our next perk will be a more feasible pick. NEW Transcendence: When cast with full grenade and melee energy, Stormtrance restores your health to full and drains slower. This is not a new perk, per se. It is actually a transplant of the old perk Wellspring from the Class Talent tree with a new name. While we kinda liked “Wellspring” as a name, it’s good to see the perk as a whole stick around. With the introduction of the Alchemist’s Raiment, we can see the two of these offsetting one another’s weaknesses. The Raiment requires Super to be full, but will recharge Grenade and Melee when orbs are consumed, while Transcendence simply needs to be cast with full Grenade and Melee for its benefits to be applied. If you plan smartly around your fireteam’s Super use, you can get a few free Grenades in before using a supercharged Stormtrance that also brings you back to full health. Excellent in PvE, and probably essential in PvP if you have any worries about being picked off during the wind-up animation. NEW Electrostatic Mind: Stormtrance charges faster when allies are near. When Stormtrance is active, nearby enemies take damage. As Gathering Storm’s replacement, Electrostatic Mind possesses identical benefits, with a slightly different description – and a weirder name. Not much more to say about a perk we’ve already covered. It’ll obviously shine in PvE, though it looks like the damage done to nearby enemies isn’t exactly revolutionary, given what we saw in the stream. It appears to be distributed in a small burst of radial arc energy. The real benefit of this perk is the increased charge time, so long as you stay near your teammates. Agility doesn’t hurt, either. NEW Arc Web: Enemies damaged by your grenades chain deadly lightning to nearby enemies. Well, Danny and Sandy won’t be happy, but Greased Lightning has been renamed Arc Web. Lightning Grenade seemed like it might be very poised to take advantage of this, but Arcbolt will certainly be no slouch in this department either. Imagine being tagged by an Arcbolt, only to see it fork in two different directions, tagging a second, third, fourth, or even fifth teammate with chained Lightning. We can see it being a powerful cleanup tool in PvP, and the best way of making your Stormtrance an offensive powerhouse in PvE. You won’t get it as often as if you were running Electrostatic Mind, but you will lock down more foes with lightning when the fireworks start. 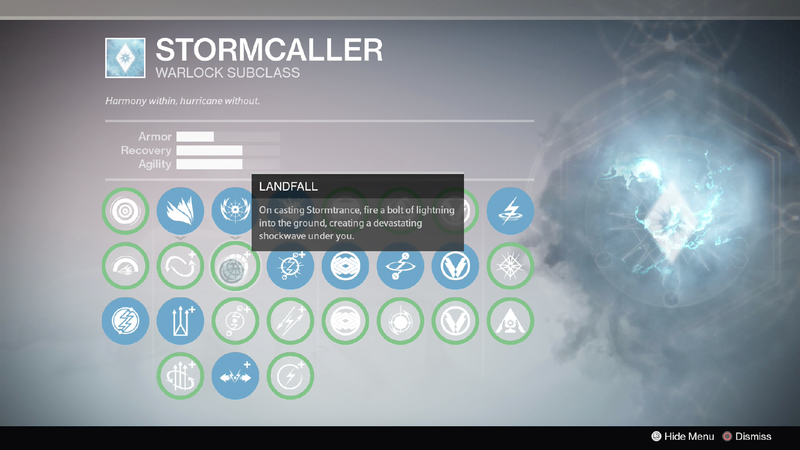 Much like the Sunbreaker, pretty much everything definitive that the Stormcaller promised is still here. None of the most encouraging perks, such as Perpetual Charge, Rising Storm, or Wellspring – er, Transcendence – were eliminated, which is good news from where we stand. 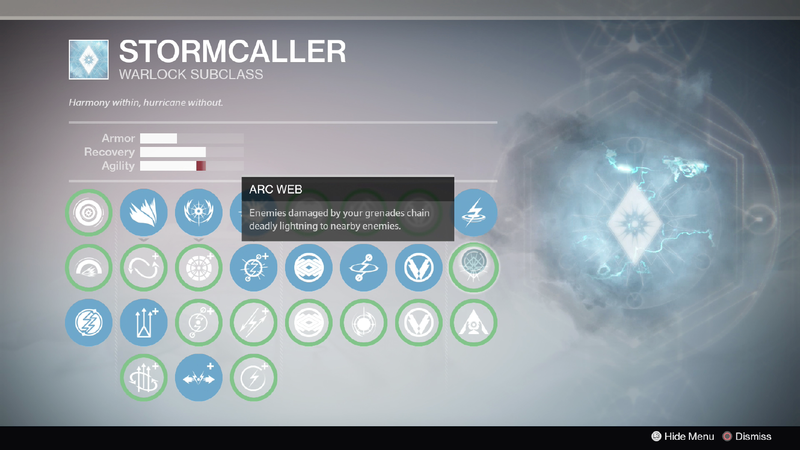 The Stormcaller seemed fairly balanced, if a little frail in PvP. 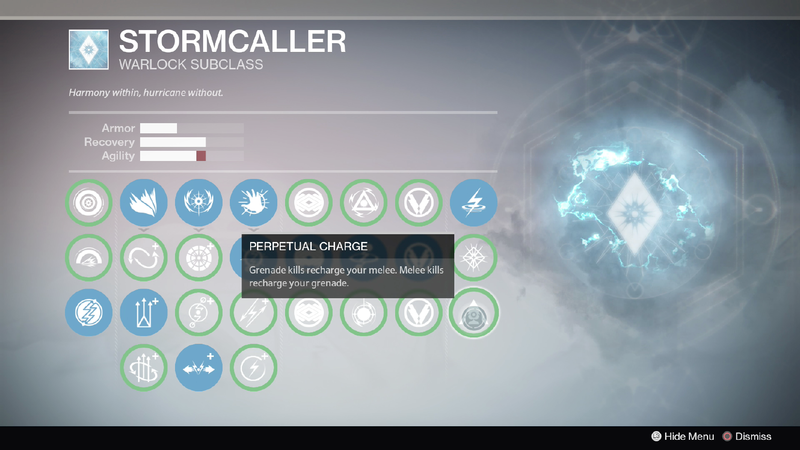 The removal of Rain Check in favor of Pulsewave, and Uninsulated for Feedback, are both positive changes for the Stormcaller. Rain Check was simply too situational, and Uninsulated was Uninspired, basically just replicating a perk from an Underwhelming Titan Exotic that doesn’t see much PvE or PvP love as is. 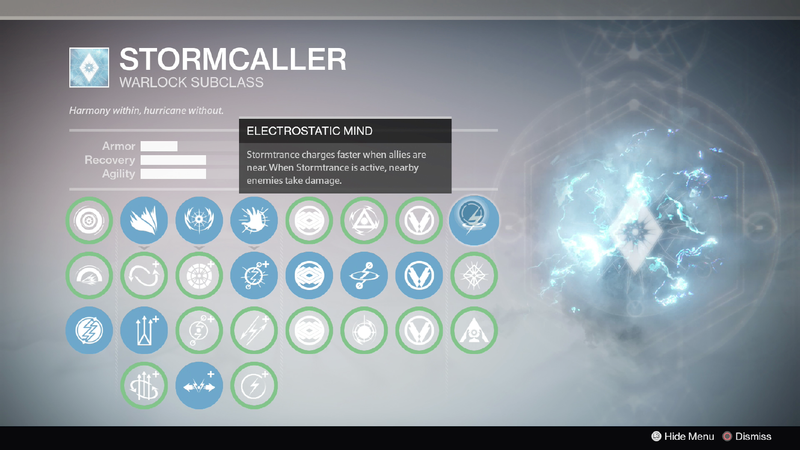 Overall, we’d rank the Stormcaller to be in a solid place, with a very powerful perk profile heavily centered around reducing CDs, and some strong damaging tools that let it go toe-to-toe with the Sunbreaker for raw damage potential. 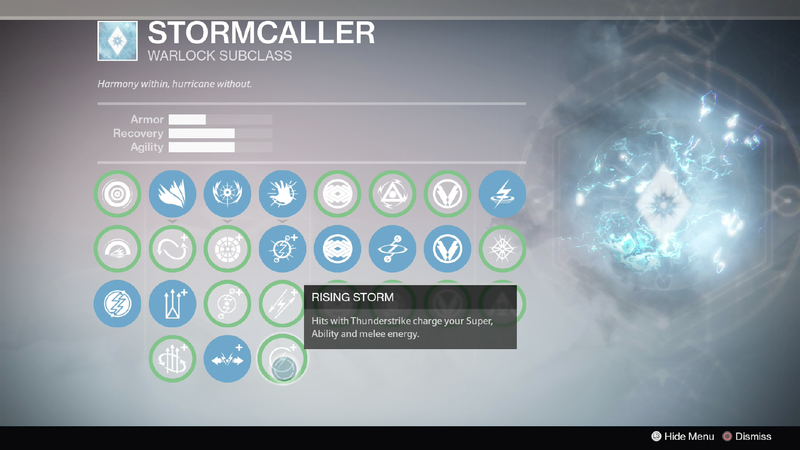 How do you feel about the Stormcaller? From the gameplay you’ve seen so far, will it be your go-to subclass? As always, we wanna hear what you have to think, so sound off in the comments! Previous Post:Sunbreaker Subclass Overview: Updated! Next Post:Y1 Exotic News & Court of Oryx Details!